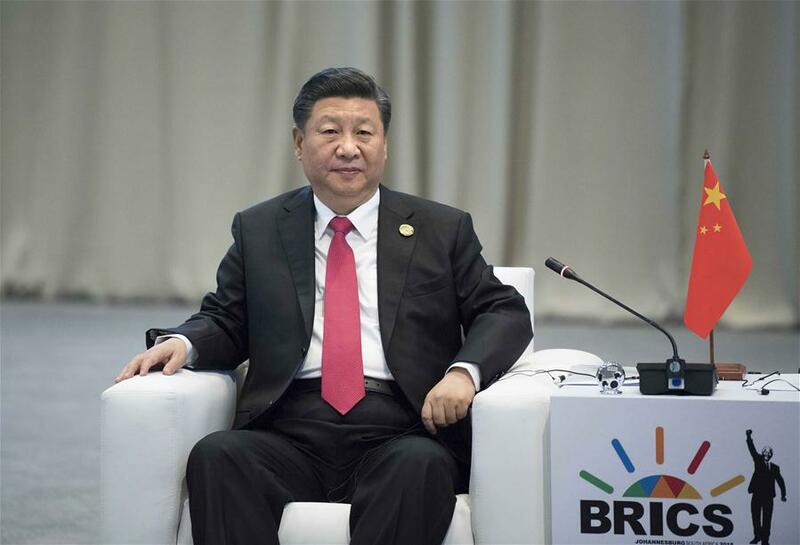 JOHANNESBURG, July 27 (Xinhua) -- Chinese President Xi Jinping on Friday called on BRICS members to expand cooperation both within the emerging-market group itself and with other developing countries in the next decade to make BRICS continue to shine. Speaking at an informal meeting to commemorate the 10th anniversary of the BRICS mechanism in Johannesburg, South Africa, Xi said that BRICS cooperation has developed from a mere economic concept into an influential international cooperation mechanism in just 10 years, demonstrating great vitality and bright prospect. He pointed out that the next decade will be a crucial one in which the BRICS countries will face major opportunities and challenges. Xi urged the BRICS countries to center on peace and development -- the two dominant themes of the times, grasp the opportunities presented by a new round of revolution in science, technology and industry, and conform to the trend of world multi-polarization and economic globalization, so as to open up a second "Golden Decade" for BRICS cooperation. To this end, the Chinese president proposed that the BRICS countries uphold the BRICS spirit, deepen BRICS strategic partnership, strengthen communication and coordination, promote an open world economy, and safeguard their common interests and development space. The BRICS countries should also consolidate their cooperation framework underpinned by economic, political and security cooperation and people-to-people exchanges, enrich the meaning of BRICS practical cooperation, continue to strive for building a big market of trade and investment, promoting smooth flow of currency and finance, improving connectivity of infrastructure and building close bond between the peoples, create more cooperation highlights, and strengthen coordination and guidance, so as to ensure that the BRICS Partnership on New Industrial Revolution can achieve tangible results, Xi said. In addition, "BRICS countries should expand 'BRICS Plus' cooperation and build an extensive network of partnerships, so that other emerging markets and developing countries can participate in BRICS cooperation to form a strong force safeguarding common interests and boosting shared development," Xi said. "The basic driving force for BRICS cooperation to flourish and shine forever comes from our common pursuit of greater development and improvement of people's well-being, and from our common aspiration to build an open, inclusive, clean and beautiful world that enjoys lasting peace, universal security and common prosperity," Xi said. He called on the member countries to work together to let BRICS cooperation benefit their peoples as well as peoples of other countries, and let it continue to shine in its second "Golden Decade." South African President Cyril Ramaphosa, Brazilian President Michel Temer, Russian President Vladimir Putin and Indian Prime Minister Narendra Modi attended the meeting and spoke highly of the BRICS cooperation in the past decade, saying that it has improved the people's well-being in the five countries, and also played an important and positive role in boosting world economic growth and improving global governance. They agreed to work together in upholding multilateralism, opposing unilateralism, demonstrating BRICS value, developing BRICS idea, deepening mutually beneficial cooperation in economy and trade, politics and security, enriching people-to-people exchanges, and constantly strengthening BRICS strategic partnership, so as to make BRICS cooperation more fruitful in its second decade.